A cloth booty for Baby Alive Whoopsie Doo! >As I said in my previous post, my daughter wanted a Baby Alive doll for her 5th Birthday. Since her Birthday was today (Happy Birthday! 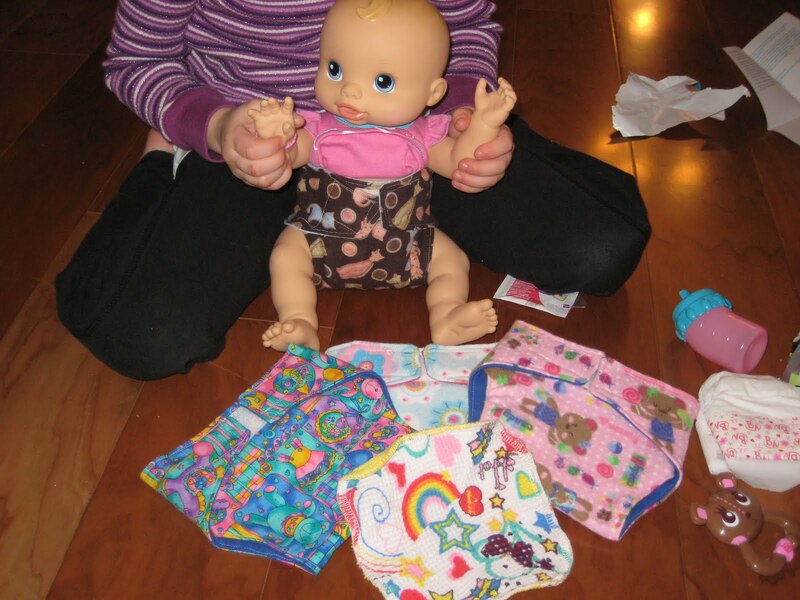 ), I can finally post some good photos of the diapers I bought for her doll! She was so thrilled with her gift, I couldn’t really pry it out of her hot little hands in order to take “good” photos. I bought 4 diapers from Heartland Dreams. Her daughter actually made them; they are flipping amazing! I paid $4 for each and they are well worth it. The normal price is $3 each, but I asked for an extra layer in the middle since these need to absorb a bit too! I think the Baby Alive brand sposies go for around a buck a piece, and even preemie size disposables are horrendously expensive, as well as wasteful. You can see the Baby Alive diaper on the right side of the photo. The HD diapers are quite a bit larger, but work just fine. I almost forgot that she included a cloth wipe for free! You can see it on top of the diaper in the front. It is soft, double sided and very well made. I’d love some for my son! The diapers (and wipe) are amazingly well made. I would be thrilled to receive a “real” diaper made as well as these. They are very easy for a child to use, the stitching is perfect, the prints are adorable…I could go on and on. My daughter was so happy to get these, and was very excited that she could “feed” her baby water, then just let them dry and reuse them! She loved the prints (I didn’t ask for specific ones). I am still peeved at myself for not buying this diaper while it was still available, and then missing out on this one too. Even this one and this one were snapped up before I had a chance! I’m such a waffler. Ugh, I swear. If I see an AI2 listed that I like, I am stalking that puppy and buying it! After seeing the doll diapers, I wouldn’t hesitate to buy anything she sells. In fact, if the doll diapers were bigger and had elastic at the legs (and a few more soaker layers), I’d put them on my son, ha ha! On a somewhat related topic, my daughter’s preschool allows the parent to bring a snack on their child’s Birthday. I’m not into excessive sugary “stuff,” and they actually don’t allow it. 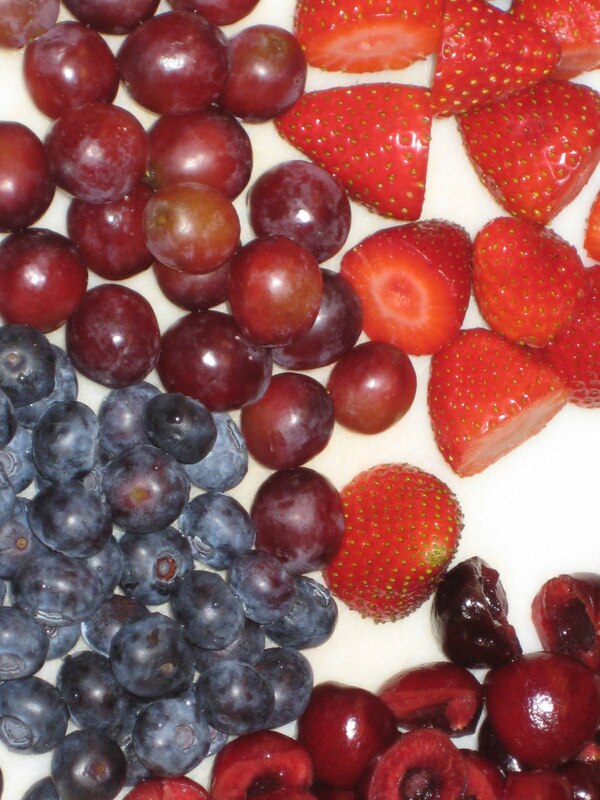 My daughter loves fruit, so I bought cherries, blueberries, strawberries, grapes, oranges and bananas. I sliced and pitted the cherries, removed the strawberry stems, sliced the bananas (also also crinkle cut them and soaked them in orange juice), and cut and sectioned the oranges. I bought some wooden skewers, I think they were 10″. The store had two lengths and these were the shorter of the two. I alternated fruits and then topped then off with blueberries to the end of the pointy tip. They were a huge hit and were gobbled more quickly and enthusiastically then cupcakes!